Uttar Pradesh Subordinate Services Selection Board (UPSSSC) had conducted Junior Assistant (Kanisth Sahayak) Typing test for the candidates who had qualified written exam. This Skill Test is to organized as a part of the selection process. Written exam Qualified candidates have appeared for the Typing test held at various centres. Now the latest news is that UPSSSC had declared the result of Junior Assistant Typing test. Also it had announced the interview schedule. Those candidates who had appeared, can check UPSSSC Junior Assistant Typing test Exam result 2015 from the direct link given below. Candidates can to check UPSSSC Junior Assistant result/ merit list from the link provided here. Those who qualify this typing test will have to appear for Interview. 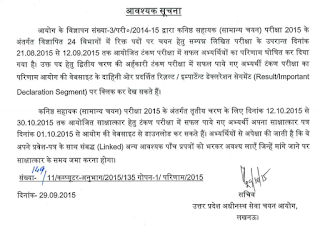 UPSSSC Jr. Assistant Interview Schedule / Dates: Interviews will be held from 12.10.2015 to 31.10.2015. Qualified candidates can download their interview letter from 01 October 2015. 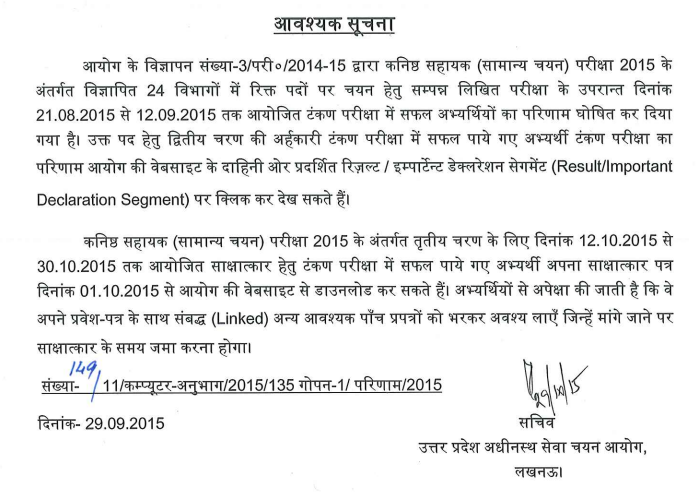 Candidates can check UPSSSC Junior Assistant Typing test result 2015 by following the procedure given below. 1. Visit official website of UPSSSC i.e. upsssc.gov.in via the link given above. 2. Click on the link for checking result. You will find it on the right side of the website. A direct link to check result cannot be posted as the website does not allow it. You have to go through official website upsssc.gov.in to check the result. 3. Enter your registration number, date of birth and gender and security code. 4. Your result of UPSSSC Junior Assistant Typing test will be shown by the website.